On the morning of November 9, 1988 in Chicago, Illinois, while being chased by Detective Mike Norris (Chris Sarandon), Charles Lee Ray, a serial killer known as “The Lakeshore Strangler” (Brad Dourif), is shot and mortally wounded. Knowing he cannot escape, the dying Charles takes cover inside a toy store, finding boxes of talking “Good Guy” dolls, and uses a voodoo ritual to transfer his soul into one of the dolls. The store is then struck by lightning and burns to the ground, although much of its inventory, including the dolls, survives. Later that morning, 6-year-old Andy Barclay (Alex Vincent) tells his widowed mother Karen Barclay (a sweet but tough as nails Catherine Hicks) that he wants a Good Guy doll for his birthday. Unable to afford the full price, Karen buys a stolen doll from a street peddler, which is the same doll into which Charles Lee Ray had earlier transferred his soul. One of the nice things about “Child’s Play” is reveled in Karen and Andy’s relationship. They honestly feel like a real, flesh and blood mother/son. She cares very much for Andy and will do anything it takes to make him happy. Being a latchkey kid myself, I could relate to Andy and I could see my mother a lot in Hick’s wonderful performance. That night, as Andy is playing with the doll – who has introduced himself as “Chucky” – Karen’s friend, Maggie Peterson (Dinah Manoff), who is babysitting Andy, scolds him for turning on the evening news and placing Chucky in front of the TV. When Andy tries to deny the accusation, she doesn’t believe him and sends him to bed. Maggie is later violently struck with a hammer by an unseen figure and falls out of the apartment kitchen window to her death. Andy, when questioned, insists that Chucky has revealed himself to be alive and that he killed Maggie. It is reveled that Chucky must take off the soul of the first person he told his secret to. Chucky now needs out of his doll body and will do anything to make that happen…including taking over Andy. 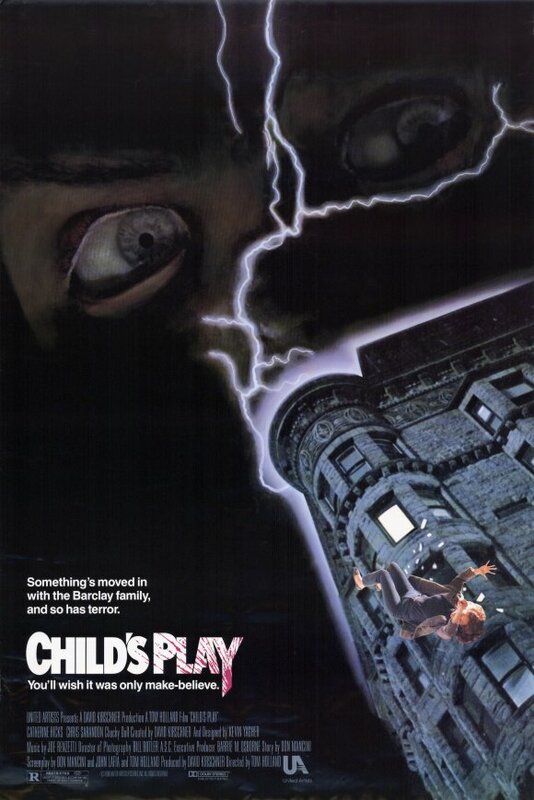 “Child’s Play” is a serious, white knuckle thriller that is nothing like the future installments of this series. You want a lovable, wise cracking evil doll? Rent “Bride of Chucky” because this movie takes both Chucky and his behavior deadly serious. Sure the voodoo elements feel a bit out of place and the ending lasts runs out of steam long before the movie is over. Nonetheless, there is a damn good reason why this movie is remembered as the best of the best when it comes to kill doll movies. The sequels all try to do their own thing and that is commendable but they were never able to outdo this classic.